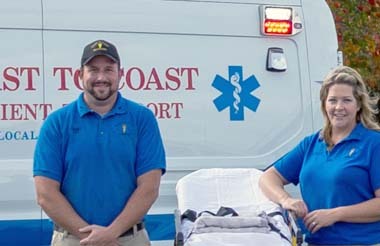 Coast to Coast Medical Transportation, Inc. (C2C) is a family-owned and operated business transporting special needs patients for over 17 years not only in Georgia but coast to coast. We work hard to ensure patients have the most pleasant experience possible while in our care. Every patient is treated like family. Q: Will my insurance pay for transportation? your insurance company for details. We're inspected by a state-approved inspector every 90 days. All units have heating and air. Two-way radio communication on board. Basic life support and emergency supplies.